I recently got an email flyer from one of my favorite websites, www.oipolloi.com, which is the internet presence of Oi Polloi in Manchester, UK, announcing that they were now carrying Nom de Guerre clothing and denim. Only a year ago, there were fewer than a dozen stockists worldwide for the brand. The ones I was familiar with were Nomad in Toronto, Canada, Stels in Boston, who, incidentally have opened up a very nice website, www.stelsinc.com, with some Nom de Guerre on sale now, and with much more to come, and Blackbird in Seattle, and of course, the eponymous Nom de Guerre store, irritatingly difficult to find, on Broadway in Manhattan. However, apparently, the distribution has expanded aggressively, with stores like Peasant in Michigan, Brigade in Cleveland, and Jake in Chicago carrying good selections of the line. In addition, the line is also carried now by world class tastemakers like Paris’ Colette and London’s Liberty. Old “Hipsters” like me still moan about the old ISA (named after the driving force in Nom de Guerre, Isa Salabi) store in Williamsburg, Brooklyn, where Levis and Nikes featured prominently. 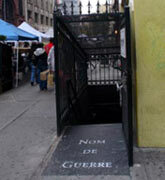 The Nom de Guerre store was built with an eye towards expansion, and the house line at that time consisted of some tees, and iirc, a hoodie that is still in the line, but it was primarily a multi-brand store. However, with the success of Nom de Guerre, ISA was closed, and Nom de Guerre focused more and more on the Nom de Guerre brand. The store is a lot sleeker than the original Williamsburg store, and the multi-brand stuff has long been relegated to the lower room. Inevitable, I suppose, with Nom de Guerre trying to pierce the designer market, but I feel a bit of loss at the older, slightly rickety space that was ISA. For me, the fit of the new Nom de Guerre pieces, and the military inspirations wedded to sturdy, textured materials, were the drawing point. The black wool herringbone M65, which I picked up last year at Stels, fits extremely well on my slim, slightly athletic frame, and I am extremely glad to have picked it up immediately, since it sold out in days (and there was a mad scramble to find them soon afterwards.) However, the design and construction of the pieces are not without problems. For example, because the shoulders of the M65 were quite slim, Bi-swing shoulders were put in to accommodate movement. Unfortunately, there was not enough extra material in the lining, and extra material is nearly always allowed for in acetate or Bemberg lining. The result is that the lining of the jacket ripped when stretched my shoulders. This shouldn’t happen in a sports jacket, much less a sturdy military style jacket. That everything was made in Japan (some of the most interesting textiles are Japanese) mattered not at all to me if the design was flawed. I had the occasion to look at the new Fall collection last weekend. There are some very interesting pieces. The shawl collar double-breasted jacket (shawl collar jackets and sweaters have been fashion staples for a while now,) and a jacket with flapped front pockets in collaboration with the iconic company Mackintosh, in a black watch tartan, are standouts, although I already have an outerwear piece chosen for the coming fall, and am more interested in the space-knit fitted crewneck sweaters. The design flaws are being worked out. All in all, I am pretty happy to follow this brand and see where it is headed.